A new pharaoh is rising in Egypt. Gen. Abdel Fata al-Sisi is preparing to grasp supreme power, most likely as the country’s next president. He is posing as democracy’s savior while his troops detain or kill those opposing him. The arrests and shootings continued during last week’s constitutional referendum. During the Cold War the U.S. stole Cairo away from the Soviet Union. When revolution loomed in 2011 the administration endorsed dictator Hosni Mubarak, before trying to work with newly elected President Mohammed Morsi. But the latter failed badly and discredited the Muslim Brotherhood, making his defeat almost certain in the next poll. Morsi’s supporters are paying an even higher price. Although the Brotherhood was not without blame, the military killed hundreds or more in the August crackdown in Cairo. Since then thousands more have died and been arrested. Gen. Sisi has been restoring the Ancien Regime, tapping military officers as provincial gauleiters, recreating Mubarak’s secret and intelligence police, reinstituting military trials, enacting strict new restrictions on demonstrations, arresting journalists, deploying private thugs against Morsi supporters and regime critics, and prosecuting protestors. McClatchy’s Amina Ismail and Nancy Youssef reported: “Egyptians caught in the roundup have told McClatchy they were tortured while awaiting charges. Islamist leaders claim that the government is rounding up family members in the night as leverage against them. Lawyers tasked with representing arrested Morsi supporters often are arrested when they go to be with their clients.” The new constitution maintains the military’s privileged status and protects repressive state institutions from outside control. The West need shed few tears for the Brotherhood. However, the group withstood decades of repression before and emerged strong enough to win Egypt’s first legislative and presidential elections. Moreover, by confirming the extremist critique that democracy is a fool’s errand, Gen. Sisi has left opponents of his incipient dictatorship feeling they have little choice but to use violence. The Mubarak regime’s crackdown on the Brotherhood four decades ago sparked the formation of new radical groups, including al-Qaeda. Before joining that organization current leader Ayman al-Zawahiri was tortured by the Mubarak regime. However, the administration still refuses to call a coup a coup. It reluctantly withheld portions of the $1.55 billion in annual foreign aid, while assuring Cairo that doing so was not “punitive.” Then the administration pushed to relax aid conditions. But most of the roughly $75 billion given to Cairo over the years enriched political and military elites and funded the purpose of prestige weapons from American arms makers. The U.S. never received much “leverage” in return. For instance, the knowledge that the Egyptian military would cease to exist after a war with Israel, not American money, kept the peace. Moreover, the U.S. had no credibility to enforce conditions since it never was willing to stop the money. The administration finally (kind of) did so last fall, but if America runs back to Cairo, cash-in-hand, the former will never again have the slightest hint of leverage. Moreover, the regime now is flooded with money from Saudi Arabia and other Gulf states and doesn’t need American assistance. Worse, underwriting a murderous regime inevitably stains the hands of American policymakers. 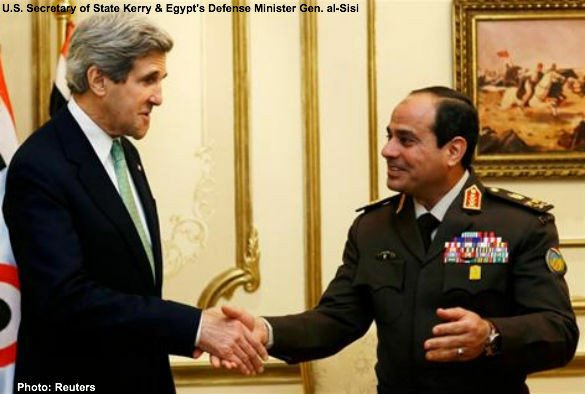 Who can believe Washington’s lectures on human rights when it is actively funding a grotesquely repressive regime in Egypt? The U.S. shouldn’t support the Brotherhood or the military. It’s time for America to exit the Egyptian imbroglio. Submitted by sir_aslan on Wed, 01/22/2014 - 16:55. Its really unfortunate that so many of those who claim the mantle of Conservatism have been dooped by the CFR and the Obama administration. First of all, Morsi and the muslim brotherhood co-opted Egypt's revolution for liberty that overthrew Hosni Mubarak. The Muslim brotherhood was never interested in Liberty or Freedom. They were only interested in Power. secondly, it is true that he was elected President and quite honestly everything happened so fast that the Egyptian people barely had enough time to choose a worthy candidate from the very narrow field they were presented with. However, once Morsi was elected President he sought to close down all avenues of dissent and impose Sharia law on the Egyptian people. The Christian Coptic Churches and those roughly 10 percent of Egyptians who are Christians were not welcome in the country. In fact, later on the Muslim brotherhood burned over 90 Coptic Christian Churches in Egypt and many Christian refugees had to leave Egypt. Once confronted with dilemna of having a new president who sought to consolidate power and implement a Constitution based on Sharia law, the Egyptian Intellectuals and Professionals supported deposing Morsi because they realized that a mistake had been made. The present regime and most of the Egyptian intellectuals believe that Obama is a member of the Muslim Brotherhood and has ties to Morsi including members of his cabinet. Its no secret in Egypt and as of now the people hate Obama and are turning to hate America for the very articles that Doug Bandow, Senior Fellow at the Cato institute has written. This very article that I am replying to is no different from reading a propaganda piece in the New York Times. I am telling you that the Present regime supports the state of Israel which is the antithesis of Morsi and his band of brothers who belong to the Muslim Brotherhood.